I received this in my Reader client today. I thought, "how perfect! What great questions!" Thank You OLL (who brings us NaNoWriMo and Script Frenzy) - and I'm borrowing your idea, with due credit, for today's Razor's Edge. For the minimum, think about the questions they pose - write out your desires. And for the more artistically or the more visually oriented, create a representation of your own writing hut. What would your writing hut look like? I’ve been obsessed with tiny houses for a while. They just seem so tidy and stylish—like a perfect solution to the sprawl of everyday life. Someday, I fantasize, I’ll just buy a beautiful plot of land in the middle of nowhere, roam all day, and sleep comfortably in my little space. More realistically, though, I’d just like to have a small structure to work in. 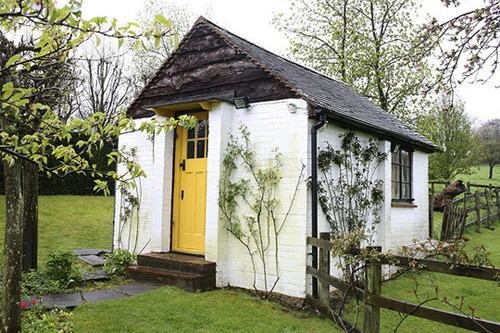 For inspiration, I’ve been looking at this post from Re-Nest—a gallery of writing huts used by Roald Dahl (pictured above), Mark Twain, Virginia Woolf, and others. Currently, my home workspace is an unused walk-in closet that is way too close to the television and way too connected to the internet. It would be so awesome to walk out the door and into a cozy, spartan set-up… and not leave until I was done with my writing for the day. Laurie Halse Anderson recently designed and built her own writing hut. If you could do the same, what would yours look like? What would you need to have inside? And what would you definitely want to keep out? I love tiny houses too, which is funny considering I suffer from bouts of claustrophobia. I think I was scarred as a young child after reading a story on a cave exploration gone awry. But, small living quarters? Dreamy. And, that house that Laurie Halse Anderson's husband built? Wow.